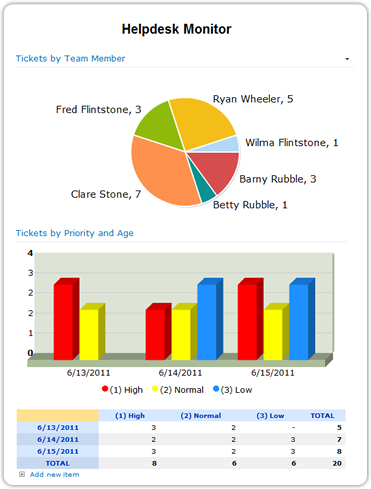 How your team are progressing with High Priority Tasks. In this example we are going to use PivotPoint with a SharePoint “Issues” list, to monitor the activity of a Help desk or customer service team and address these issues. The dashboard on the right shows you how, using 2 PivotPoint web parts, you can monitor activity in your issues list to keep on top of staff workloads and KPI’s. 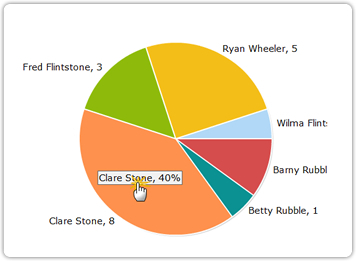 In this example, you can see that although workload should be spread equally between all team members, Clare has far more on her plate that the others, with 40% of the open tickets. You can also see that although the team is targeted to resolve all issues within 3 working days, you still have 5 tickets open which are approaching that deadline, 3 of them “High” Priority. So we need to take some action to sort this situation out. We can see that Clare has a lot of old tickets hanging around, she’s not getting things cleared up quickly enough, and 2 of the High Priority Tickets that are nearly overdue are sat in her box. 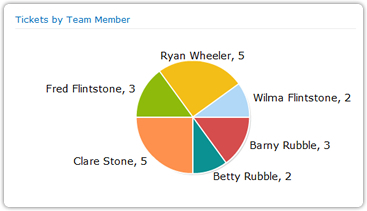 So, let’s reassign some of these tickets, including the 2 High Priority ones, to team members with less on their plates, Betty, Barny and Wilma look like they might have time for a little extra work. Going back to the dashboard we can see that thing’s now look a lot more under control.